Infectious diseases are an on-going concern in current medicine, with striking reports about viral infection in hospitals and concerns surrounding the threat of resistance to antibiotics. Viral infection is powerful, as indicated by 1•8 million people dying every year of HIV/AIDS and 0•5 million per (non-pandemic) year from Influenza. About 34 million people have HIV/AIDS at present, with around 4 million people suffering from influenza each year. These scales of viral infection and death have generated a lot of medical and scientific interest. One area of exploration is the structure of the virions (also known as virons), the individual virus ‘particles’, a bit like the cells that make up a species of bacterium. Our current understanding of virion structure comes from a number of sources, and was started mainly by the work of scientists like Rosalind Franklin  and D. L. D. Caspar . 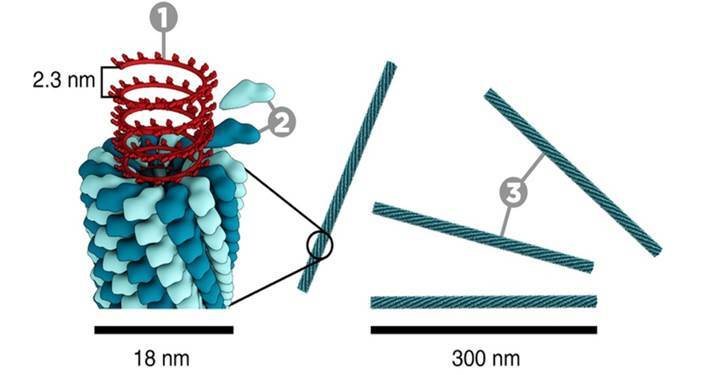 Their work showed that a limited range of proteins of a consistent shape fitted together to make a discrete virion such as the tobacco mosaic virus (Fig. 1). In these assemblies, a central core of DNA or RNA is protected and transported by a protein coat. This protein coat, called a capsid is made of individual protein blocks called capsomers. Figure. 1. The construction of the Tobacco Mosaic Virus (TMV). 1, DNA; 2, Coat proteins (‘capsomer’); 3, capsid. Photograph courtesy of www.microbiologymadeeasy.com. More recently, it has become clear that some viruses have evolved to include a lipid mono- or bi-layer. HIV and Influenza (Fig. 2) are examples of this. The existence of such a lipid bilayer in a virion means that the way it interacts with host cells is somewhat different to virions without a lipid membrane. Importantly, when a virion ‘finds’ a cell to infect, its lipid membrane merges with that of the host cell, inserting the DNA or RNA into the cytosol, the liquid medium inside a cell. Once the viral DNA or RNA has been replicated by the host cell, the virion leaves the cell taking with it a portion of the cell’s membrane. This is explained more fully here. Figure. 2. 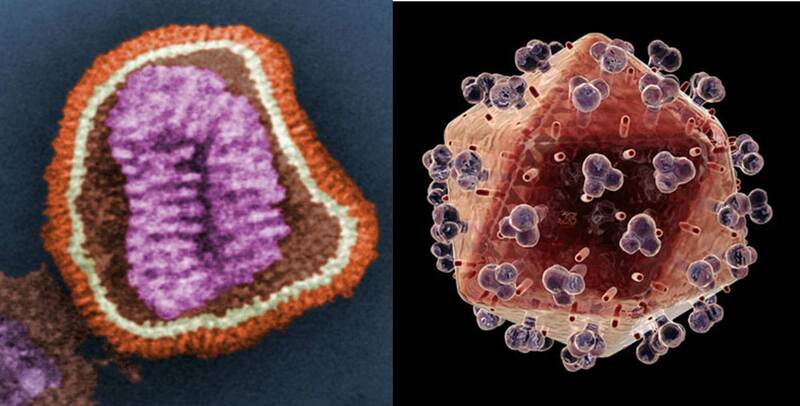 Left: coloured image of an Influenza virion; Right: coloured image of an HIV virion. The orange/ochre area of both the Influenza and HIV virions represents that of the lipid surface. Images courtesy of Wikimedia commons and www.topnews.in, respectively. Such viral ‘budding’ has several interesting features. For example, if the virion needs proteins on its surface (the protruding blobs on the HIV virion, Fig. 2, are an example), those proteins need to be placed there somehow. This requires protein synthesis of the viral proteins by the cell’s machinery. More generally, the lipid profile of the viral membrane is not necessarily that of the cell. So, in order to bud, the virus is reliant on variation in local areas of the cell membrane that have the optimum lipid profile the viral membrane to be constructed. The idea of a local collection of lipids for virus budding is not inconsistent with that of lipid rafts. There is some debate about how they arise in the context of viral budding, and it is not clear how much direction the virus has in the formation of such areas of local concentration. However, the evidence put forward by Brügger et al. seems clear with respect to which lipids are present in HIV virions. Their work suggests that sphingomyelin lipids are particularly important. This identification of an important lipid for viral production is a valuable molecular target for understanding the behaviour of HIV and also has potential for an approach to HIV therapy. This helps us to understand the manner in which viral replication works. R. Franklin, Nature, 1956, 177, 928-930. D. L. D. Caspar, Nature, 1956, 177, 928.